From Varsity Stadium’s synthetic turf to the iconic grass we tread on every day walking to-and-from Con Hall, the surfaces athletes practice and compete on can have a huge effect on their game. Here is a breakdown of the three types of field surfaces that can be found at U of T and the differences between them. Also referred to as synthetic turf, artificial turf is a patented composition that mimics the physical attributes of a natural grass environment and has become widely useful in recent years. Composed of specific types of plastics, rubber, and sand, the turf was first introduced to improve sports fields but now has been implemented in residential, public, and private spaces as well. 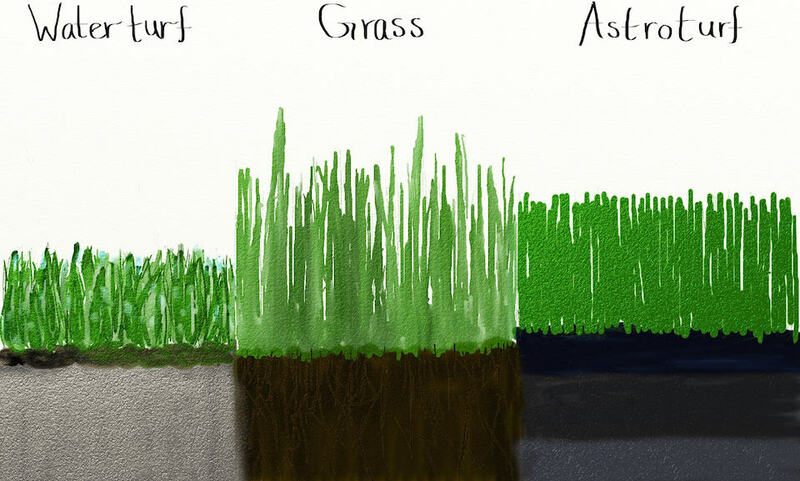 The main benefits of synthetic turf are its low maintenance cost, its durability, and its superior weather resistance when compared to a natural field. Despite these benefits, Toronto Public Health guidelines warn that synthetic turf’s pesky rubber pellets can get caught in athletic wear and implore athletes to be conscious of excessive heat on the field. Although touted as more durable than grass, artificial turf does deteriorate if not properly maintained, which was highlighted by the US women’s soccer team’s recent refusal to play on a decrepit and dangerous turf field in Hawaii. Deemed to be the safest field surface for athletic play, good ol’ grass has also been know to be unreliable when exposed to high levels of activity without significant maintenance. Although we may be most comfortable with this field, the quality of natural turf that is not routinely maintained for athletic use is highly dependent on recent weather — think front campus after a rain-storm. Although more labour intensive to maintain than artificial turf, grass has become the catalyst for gender equality in sport. This is especially true for men’s and women’s soccer; where women are routinely expected to play on turf, while men get to play on the much preferred grass. Everyone’s favourite Toronto team, the Blue Jays are even looking into incorporating a real grass field by the 2018 MLB season to replace the current artificial turf in the Rogers Centre. Introduced mainly for competitive field-hockey play, the benefits for this type of artificial turf includes reduced abrasive effects, a constantly lubricated field, and a nearly unaffected path of motion for a ball in play. Water-based turf can also increase the level of activity during a match by allowing athletes to traverse an area of turf much quicker. A water-based turf such as on back campus, physically does not have an underlying fill material and is instead composed of multiple uniform layers of composite material with the playing surface on top, thus giving water-based turf its iconic smooth look and feel. Editor’s note: An earlier version of this article made erroneous references to AstroTurf. The Varsity regrets the error. 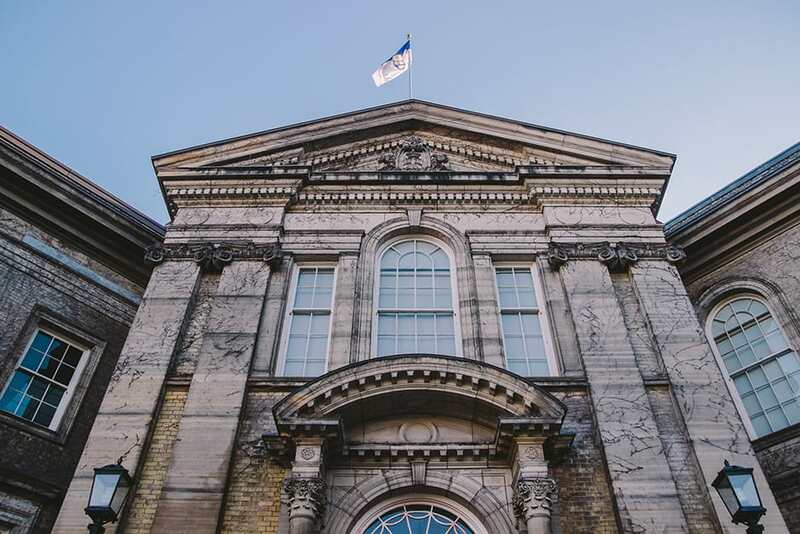 Last fall, four different design teams submitted proposals for the revitalization of U of T’s front campus. These beautifully rendered images paint a portrait of everyday student life with accuracy reminiscent of Enlightenment-era art. Indeed, many subtle themes — like weather and depth of field — are captured so elegantly that they deserve a thorough, unforgiving critique, just as any artwork would. 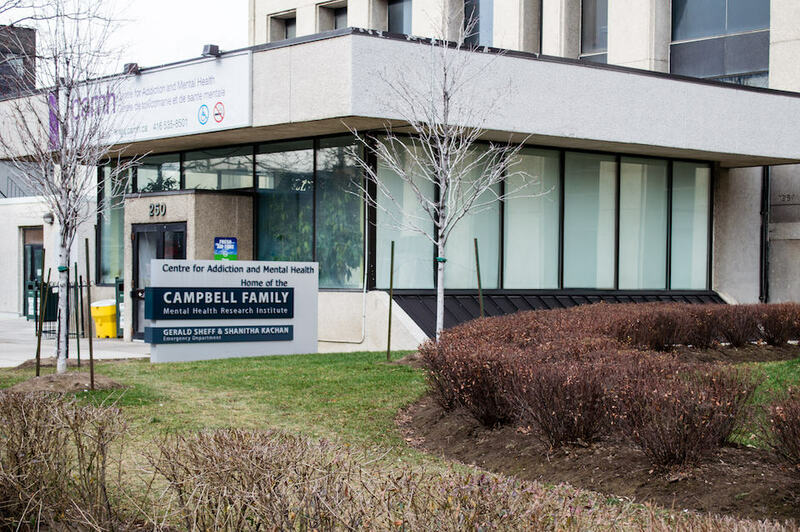 A bright and cheerful reimagining of the front campus is the concept behind this picture. It is a place for escape and contemplation. The figures traffic leisurely, seemingly unaware that they have three assignments and two exams the following week. The sun — a symbol of life — shines brightly on the universities’ patrons. They do not face the viewer; rather, they move in a directionless fashion, blissfully ignorant to the crippling anxieties of student life. Here, the field is completely transformed by the artists, harmoniously combining the man-made with nature. The earth has been raised into a grove and fitted with an escalator. Clearly this is a metaphor for higher education and the unlimited possibilities it offers. The concept is depicted brilliantly, while also offering functionality, as the design centers on the best way to park more cars underground. Taking the award for planning negligence a random and, yes, sloppily placed ice rink that appears to simultaneously block the flow of pedestrian traffic and completely isolate the J. Robert S. Prichard Alumni House? The fictitious skaters spin round the house, presumably deaf to the pleas of the trapped alumni, cold and hungry in their poorly designed captivity. 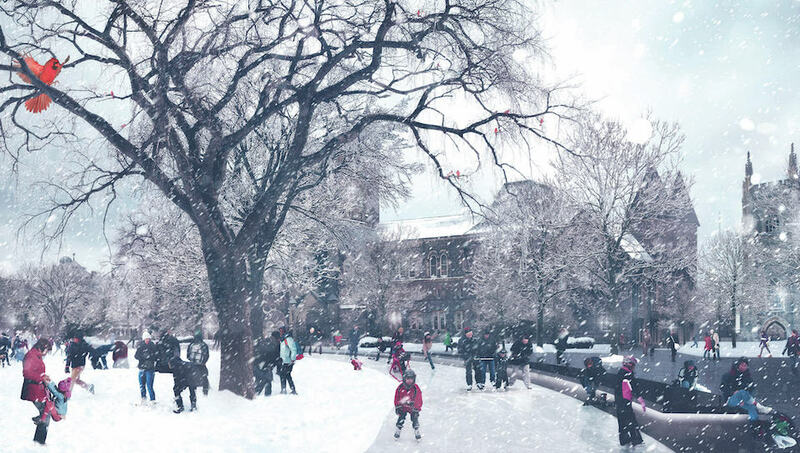 This image depicts the front campus as an inclusive, picturesque, and communal space where everyone can enjoy a traditional Canadian winter activity: ice-skating. Students will appreciate this perfect excuse to procrastinate on their studies. Later, in summer, the space may be used for a running track. Both options allow local residents to overcrowd campus space while everyone else circles ‘round and ‘round, as though they are on a never ending merry go round. Track and Field athlete Hayley Warren. Courtesy Bryan Li. The consistently under performing Blues’ football team was put out of their misery in October, losing their last game of the season 45-9 against the Ottawa Gee-Gees. With a slightly better 3-5 season record this year — as opposed to last season’s 2-6 — the Blues do seem to be improving slowly. Despite an eighth place OUA finish for the team, the Blues saw strong individual performances by the likes of punter TJ Morton, who completed the farthest punt this season in the OUA at 68 yards, and rookie linebacker Matthew Renaud who was chosen for the 2015 OUA all-rookie team. Despite a promising regular season performance, the Blues’ women’s soccer team was eliminated from quarter-final OUA action at the end of October by the visiting Queen’s Gaels. The Blues, who finished the year 9-6-1 dropped to fourth place overall in the OUA east division — one place lower than last season. 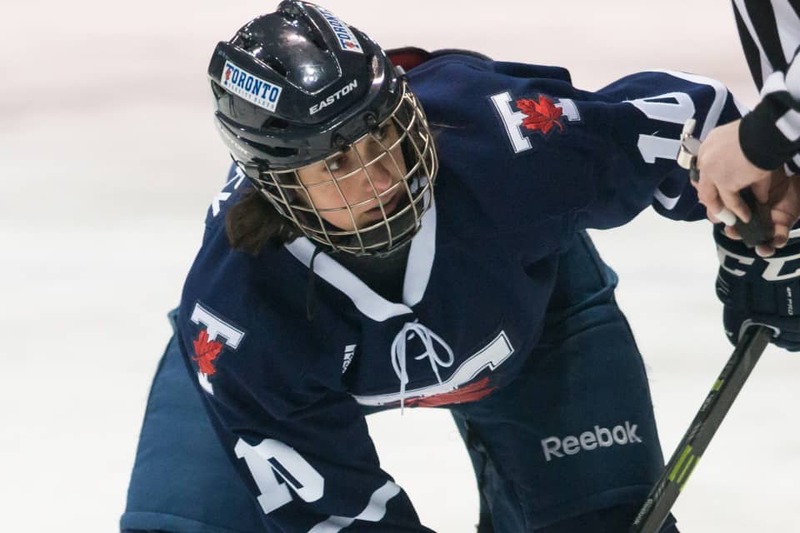 Rookie Natasha Klasios had a standout season, leading the Blues in goals scored and was also named OUA east division rookie of the year. On the men’s side, the Blues enjoyed a taste of success by beating out hometown rivals Ryerson 3-0 to take the OUA bronze medal for the second year in a row. At the CIS championship, hosted by eventual tournament winners the York Lions, the Blues didn’t fare as well. The team lost both of their games, ending their tournament and season. Despite losing both games, the men finished in the fifth spot, and co-captain Lukas MacNaughton was named a CIS second team all-Canadian. The chronically underrated and unrecognized Varsity Blues women’s golf team took home their fifth OUA banner since 2005, marking the team’s fourth banner in a row. The women have now Western University for the most consecutive OUA wins. The women won the competition with a final score of 471, making the difference between the Blues and second place finishers Waterloo a mere 26 strokes. U of T PhD student Laura Upenieks won the Judy McCrae Trophy by one stroke at 154. On the men’s side, the Blues came away with a silver medal with a score of 608, and were lead by individual bronze medal winner Ryan Tsang who shot 148. U of T’s men’s and women’s swim teams are poised to defend their OUA banners this year, with huge wins against the Western Mustangs on Saturday. Winning 22 of the 26 races, the Blues are definitely the team to beat this season — just as they have been for the past two seasons — with consistent and impeccable coaching by Byron MacDonald who is in his thirty seventh season with the Blues. In individual feats, second-year phenom Kylie Masse not only broke the Canadian 50m backstroke record by 0.16 hundredths of a second, but also nearly nudged out Olympic gold medallist Missy Franklin in a race in Minnesota in November, missing the gold by two tenths of a second. Both the men’s and women’s teams are establishing themselves as a force to be reckoned with, and if they keep up the gold medal, record-breaking performances, the squads won’t have a problem becoming third time OUA champions. 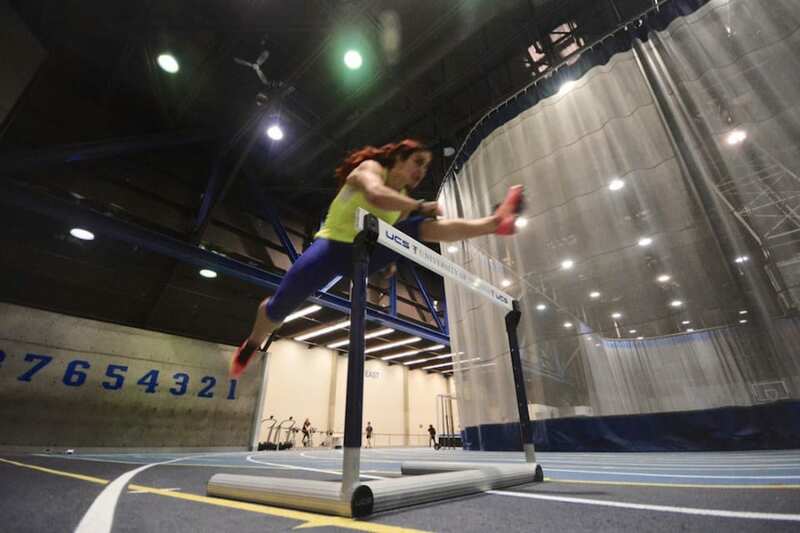 Coming off OUA and CIS banner winning seasons, the Varsity Blues women’s track and field team will have to work harder than ever to defend their title without the help of Pan Am 1,500m bronze medallist Sasha Gollish. Despite Gollish’s absence, the women were aided by fifth-year veteran Rachel Jewett, who won first place in the 600m last weekend at the Can Am Classic in Windsor, contributing a leg and to the 4x800m relay, which also placed first in a time of 8:58:84. At the same meet, co-captain Julia Stille represented the field competitors by bringing home a gold in the triple jump competition with a distance of 12.30m. While defending their CIS banner may be difficult, the women are set to dominate on home turf this Friday when U of T hosts the Fred Foot Pentathlon in the Athletic Centre Field House. Currently sitting in fourth position in the OUA standings — right behind GTA rivals Ryerson — the Varsity Blues men’s volleyball team has something to prove. The team is trying to overcome their tenth place finish and dismal 4-16 record in the OUA last season. At 6-4 by mid-season, the men have already improved last years record, thanks in part to precise hitting by third year William Colucci and Stefan Ristic that latter of whom leads the Blues in serves and attacks this season. The Blues have won their past two games against the Lancers and Mustangs, and are looking strong as they go into their next game against Nipissing on the sixteenth. Is this real life, fantasy, or gambling? Is it too late, and do we want to stop the machine that is daily fantasy sports? With Super Bowl 50, March Madness, and the NHL post-season all coming up in quick succession, sports fans everywhere will be preparing for fantasy draft picks on various online platforms. The estimated amount of fantasy players worldwide — according to the Fantasy Sports Trade Association website — reached an all-time high of 56.8 million in 2015. This popularity can be attributed to the success of Daily Fantasy Sport (DFS), wherein participants enter their roster into a competition hosted by specific websites like DraftKings and FanDuel. Some of the most popular daily fantasy websites, including DraftKings and FanDuel, are both valued well over $1 billion. 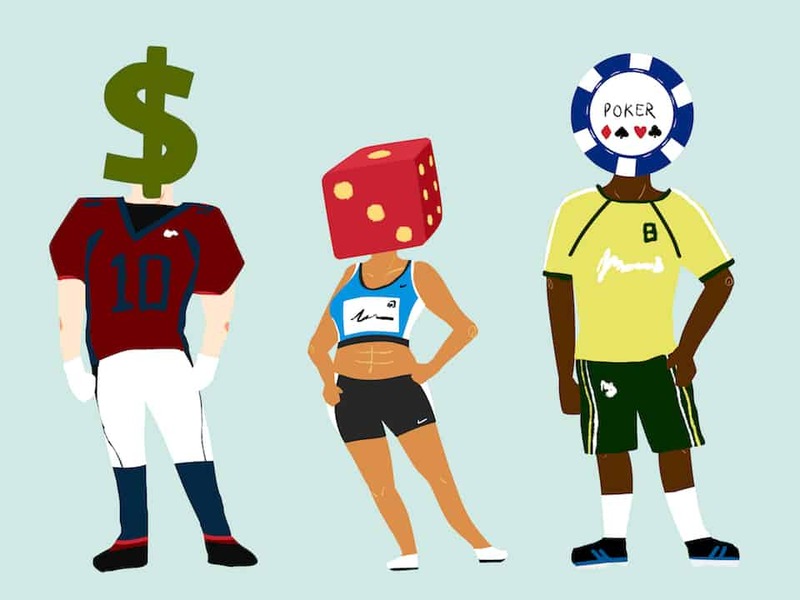 These sites can see participants win millions off of their sports knowledge. Both sites profit substantially through heavy marketing campaigns over football’s off-season, which emphasizes the possibility of making massive amounts of money over a single night. Advertisements with slogans like “ Win $100,000 Free” imply that a single night of fortuitous play can result in a tremendous amount of money. Despite their annual rise in popularity the fantasy sports industry hit a major roadblock last year. DFS has recently been accused of being a gambling network. The argument posits that since daily fantasy sites like FanDuel and DraftKings depend on a single night of player performance, participants are wagering on the results of a game. Defenders of DFS argue that it is skill-based, and successful DFS players require discipline and money management ability. Following the November 10 ban of DFS in New York State last year, the Canadian Gaming Association (CGA) announced that it had decided that DFS is illegal under the Criminal Code of Canada. The CGA commissioned attorney Don Bourgeois to investigate the legality of DFS under the Code, who interpreted it to mean that in games of mixed skill and chance, the latter trumps the former and falls under the umbrella of chance games. As a result, it is considered gambling. Bourgeois’ interpretation may have come too late. In Canada, many major investors have sunk millions into DraftKings and FanDuel. Counted among DraftKing’s investors are the NHL, MLS, and Maple Leaf Sports and Entertainment Ltd. — Canada’s largest private sports company and owners of the Toronto Raptors and the Maple Leafs. In July, DraftKings announced a new round of funding worth $300 million. This begs the question: have DFS become too big to fail? Without rapid intervention the multitude of seven figure investments might allow DFS sites to survive. With DFS sites having their hooks so deep into major Canadian industries’, it would be tough to pass and enforce legislation prohibiting DFS. This seems to leave only one question: does one go with Wilson or Brady? With the conclusion of the fall semester, many teams are prepping for upcoming playoff seasons — kicking practices and remaining pre-season games into overdrive. For the Varsity Blues men and women’s hockey teams, January spells the imminence of the postseason, with both teams vying for spots in the playoffs. In preparation for what looks liken an up-hill battle to the OUA championships, we take a look at the fall season, and preview the upcoming winter postseason. The Blues women picked up right where they left off this season, despite a number of key off-season graduations and departures — speaking to the consistency of the team’s coaching. The coaching staff, headed by Olympic gold medalist Vicky Sunohara, has the team playing a disciplined, effective style. Inexperienced goaltending was a major cause for concern going into the season. During training camp team captain Kristi Riseley stated that the team was confident with their new players, and the rookies have certainly proved her right. Thirteen games into the season, dynamic goaltending duo Hailey Farrelly and Valencia Yordanov have posted phenomenal numbers, including save percentages of 0.953 and 0.941 respectively. So far, the Blues’defensive numbers have improved over last year, which in a stingy defensive-minded league makes quite a bit of difference. With a number of veterans leading the way, the Blues have also improved offensively. Fourth-year forward Taylor Day, who had a difficult offensive season in 2014-15, has bounced back and emerged as the team’s leading scorer. Fellow upper-years Sonja Weidenfelder and Riseley have also stepped up their output this season. While the rookies have been mostly used in defensive and energy-line roles by Sunohara, it wouldn’t be surprising to see a few — like Jessica Robichaud — break out in 2016. The 2015-16 season has been an inconsistent one for the men’s team. Their offensive firepower remains largely intact despite key graduations last summer, however, it has occasionally exploded during two six-goal and three five-goal performances. The top teams in the OUA have regularly frustrated the Blues offensively and often blown them out on the scoreboard. The goaltending hasn’t met the standard exhibited in the past several seasons; it once again is team defence and discipline that continue to thwart the Blues. The Blues’ run-and-gun offensive-minded style has been extremely exciting to watch over the years, and this season is no different. Creative players like veteran Christian Finch and standout rookie Matt Campagna have thrived in scoring roles, and players like captain Andrew Doyle and third-year Dean Klomp have responded well to increased ice time. However, the team’s overall scoring has still decreased and the defence hasn’t tightened up to account for it. Special teams have been another huge concern for the Blues. Despite their skill, the Blues’powerplay has only scored six goals so far this season and they have struggled even more with killing penalties. These issues have largely accounted for the team’s goal differential problems, although the Blues allow far too many scoring chances at even strength, getting outshot on average 37 to 28. The Blues find themselves in a very similar position to New Years Day last year. The team will have to completely re-evaluate its playing style, and possibly sacrifice offensive flair in favour of a tighter defensive scheme. To maintain any hope of making the playoffs they will at have to play disciplined, conservative hockey. For me, there are a few things which define the holiday season: turkey, reuniting with family members, and, perhaps most importantly, the IIHF U-20 World Junior Hockey Championship. From Boxing Day to early January, the most talented young hockey players in the world compete with the hopes of bringing home gold for their country. Given that this tournament happens annually, and has players with little name recognition, it doesn’t seem like it should be a calendar event for anyone except the most diehard of junior hockey fans. For the many countries the World Juniors remain unrecognized. Yet for many Canadians, the event elicits an almost religious devotion. According to TSN, the Canadian broadcast of the 2015 medal game featuring Canada and Russia averaged 7.1 million viewers, with 13.4 million tuning in at some point. That’s just under 36 per cent of the entire population of Canada tuning into a single game. 19.4 million watched at least some of the tournament. The level of scrutiny directed at the young Canadian players is perplexing and inspiring all at the same time. The NBA Christmas special is yet another must-see holiday sporting event. The NBA offers several games, including a rematch of the two best teams from the previous season. Nearly 11 million people watched the Golden State Warriors play the Cleveland Cavaliers across the U.S. just as they have since the NBA began the tradition in 1947. The NHL began holding its annual holiday outdoor Winter Classic in 2013. The 2014 Winter Classic was viewed by eight million people on television, and another 105,491 people live, setting an NHL attendance record. 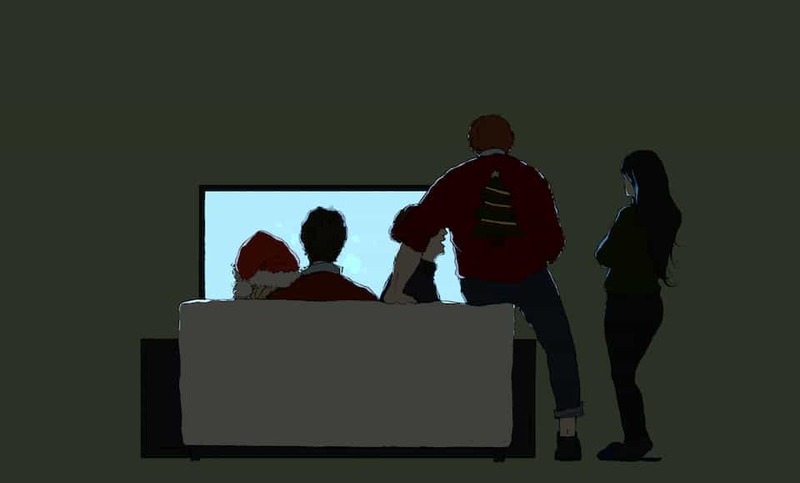 For an opportunity of year that is so often sold as a time to reconnect with family, we do watch an awful lot of sports around the holidays. It actually makes some sense — if I’m a sports fan and all the people I love are in the game together and we need something to do after we open presents, why not throw on a basketball game? In the aftermath of New Years’ when everyone’s languishing, hungover on the couch, why not watch the Rose Bowl? Just like the holidays themselves, the emphasis is not on what we are doing, but who we are with. That’s why I watch the World Juniors, and why I love the holidays. The gold medal will last me until next year, the time I spend with family and friends yelling, cheering, and crying will remain for a lifetime. Members of the Black Liberation Collective, U of T vice provost, students Sandy Welsh, Angela Hildyard, U of T vice president human resources and equity, and Sandra Carnegie-Douglas, the anti-racism & cultural diversity officer attended the meeting. Race-related census data collection can include data about student admission and graduation, and staff and faculty hiring and promotions. U of T is now exploring the details of how this data will be collected. “The university will now explore the best avenues for individuals to report such data should they choose to do so,” said Blackburn-Evans.